The Russia sanctions bill passed by the Senate last month may face a new obstacle in the House, as the Republican chairman of the House Rules Committee raises concerns about how new sanctions on Russia’s energy and financial services sectors would affect his district’s businesses. “The bill bypasses jurisdictional elements and puts an ability for any Member of Congress to become engaged in data and information that today is considered proprietary and private that is material to people who do overseas business,” Sessions said. When asked to list which companies Sessions feared would be hit hardest, his spokesperson said: “The energy industry as a whole in Texas.” The spokesperson added that Sessions is “specifically concerned” with sections 216 and 223 of the sanctions bill. Section 216 of the legislation would require the president to inform Congress before taking any action that could alter US sanctions on Russia. That provision has been a point of contention for the White House, which has been pushing House Republicans to weaken the bill so President Donald Trump isn’t inclined to veto it if it reaches his desk. White House officials are wary of how it would look if Trump — whose campaign team is being investigated for possible collusion with Russia — vetoed a bill punishing Moscow for meddling in the election. But they also argue that the bill would “inadvertently impair the Treasury’s ability to wield its sanctions tools” and “weaken the administration’s ability to credibly signal that it would calibrate our sanctions in response to Russian behaviour,” as a White House official told Business Insider. 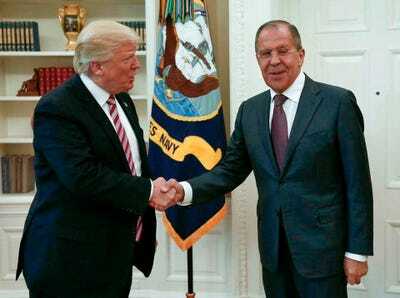 Russian Foreign Ministry Photo via APUS President Donald Trump shakes hands with Russian Foreign Minister Sergey Lavrov in the White House in Washington, Wednesday, May 10, 2017. Sessions sponsored and passed a rule in September 2015 that provided for the passage of a bill that would have suspended President Barack Obama’s authority “to waive, suspend, reduce, provide relief from, or otherwise limit the application of sanctions pursuant to an agreement related to the nuclear program of Iran.” Every House Republican voted for both the rule and the bill. Section 223 relates more directly to Sessions’ stated concerns about the sanctions bill making American energy companies uncompetitive. Sessions’ concerns about US energy companies feeling squeezed by the sanctions are not unfounded. When President Barack Obama levied sanctions on Russia over its annexation of Crimea in 2014, American exporters complained that they were losing revenue by not being able to sell to Russian companies. Radi Al-Rashed, the CEO of International Chem-Crete Co. of Dallas, which lies in Session’ district, told USA Today at the time that his company had “worked hard for two years to increase our exports and now we have this crisis and … we don’t know what’s going to happen.” He said a decline in Russian sales risked cutting his company’s revenue by about 20%. But Russia has never been an especially lucrative source for US exports. The European Union relies far more on Russia than does the United States, whose goods exports to Russia totaled $US11 billion — or less than 0.1% of US GDP — in 2013. Sessions floated the possibility in his interview with CNN that Senate Republicans had made a mistake when it came to the drafting the language levelling new sanctions on Russia’s energy industry. But a Senate Republican aide said that the Senate does “not expect” to make further changes to the bill at this time. It is unclear when the House will finally take the bill up for a vote, but it will not be before Trump holds his first face-t0-face meeting with Russian President Vladimir Putin at the G20 summit in Germany on Friday.